More Photos - You can even buy them! Are You Holding Fast to Your Dreams? Are You Listening? Are You Awake? Christina Solstad on Are You Listening? Are You Awake? David Eisaiah Engel on Are You Listening? Are You Awake? I'm thrilled to let you know that the Gallo Campground at Chaco will reopen on September 17, with limited services. That is much sooner than previously expected. The ability to camp close by, rather than 20 miles away, makes a big difference. I think it's a smart move for them to reopen to campers, bringing back visitors during the beautiful fall season. Because emergency repairs to the septic system are still being done, lack of running water limits campground services. Basically this just means semi-primitive camping. Campsites are still $10 per night - a bargain. I'm checking my calendar to see when I can get to Chaco this fall. How about you? 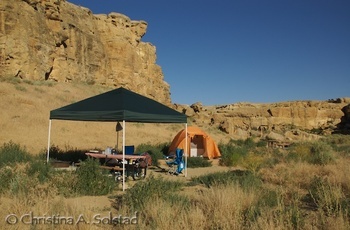 If you are heading to Chaco for summer solstice, you’ll need to make alternate camping plans. The Gallo campground closes beginning June 15 for about 3 weeks (or more) for repairs to the septic system. Why now, you ask? Solstice is when many of us head to Chaco for our Chaco fix, and many newbies discover the park. The campground is always full. I agree - solstice seems a crazy time to do this - but who knows what factors are at play here. It has needed to be fixed for about a year and a half, and the campground has been at less than capacity all that time. So I’ve included a link to download a pdf of some alternatives for camping, as provided on the park web site - the same ones listed (more or less) for anytime when the campground is full. Here are the camping options near Chaco Canyon. You’ll be driving further once you leave the park to cook dinner and get some sleep. And it will take more planning, since you can’t just quickly head back to your campsite to grab some lunch or some forgotten gear. And then there are the 10 to 20 miles of dirt road to drive, whether you come in from the south or the north. Think of it as an added bonus for your Chaco adventure. You know Chaco is always an adventure, don’t you? We had some major winds through the Chaco Canyon campground. Always beware of the Chaco winds! My wonderful shade tarp did not hold up, and was broken in two or three places. It looks pretty sad, but still provides some welcome shade in the desert heat. I am always sad when it is time to leave Chaco. It has been a great trip. For those I got to meet here, I hope your travels are safe, and we get to meet again! Braving the summer heat to attend the summer solstice events at Chaco Canyon is well worth it, as described in my previous posts: Why Attend Summer Solstice 2008 at Chaco? and Tips for a Fun Summer Solstice at Chaco. Here are some tips to help you keep cool and make the most of a summer visit. Bring plenty of water. Your water containers can be refilled at two potable water spigots in the Chaco visitor center (VC) parking lot. Be sure to recycle your containers in the large bins in the VC parking lot. Always wear a good hat and sunscreen. The hot sun is relentless. Protect yourself. Hike early and late in the day - especially for the longer hikes. Seek the coolness of the VC during the hottest time of the day. You can browse the bookstore and museum, and watch informative movies about Chaco. Bring some shade for your campsite. My shade tarp/canopy (Sports Authority) makes a world of difference, and has made other campers envious. Stake it down well for the strong winds. Protect your food and water from the animals. The ravens are incredibly smart and mischievious. Keep food in solid, covered containers, with heavy rocks on top (they have gotten in to my covered containers). Cover/disguise plastic water containers. They will poke holes in them to get at the water. I have watched ravens show the younger birds how to get water and food from campsites! No food in your tents - unless you want holes in them! Pace yourself. The heat can drain your energy quickly. Do not leave heat-sensitive items in your vehicle. Temperatures rise quickly in a closed vehicle and can destroy electronic gear or meltable items. Use a well-insulated cooler, and fill with block ice or dry ice (lasts longer). I found a good one at Sports Authority. Try to keep in shaded portion of camp, like in shade of tent or picnic table or tarp. Ice can be purchased at Red Mesa convenience store and gas station on 550/44, where you turn onto CR 7900, then CR 7950, the north road into Chaco. If you follow these tips, you will be able to enjoy your visit, despite the heat! Feel free to add others in a comment below. For more information about Christina and Spirit of Chaco, click here.